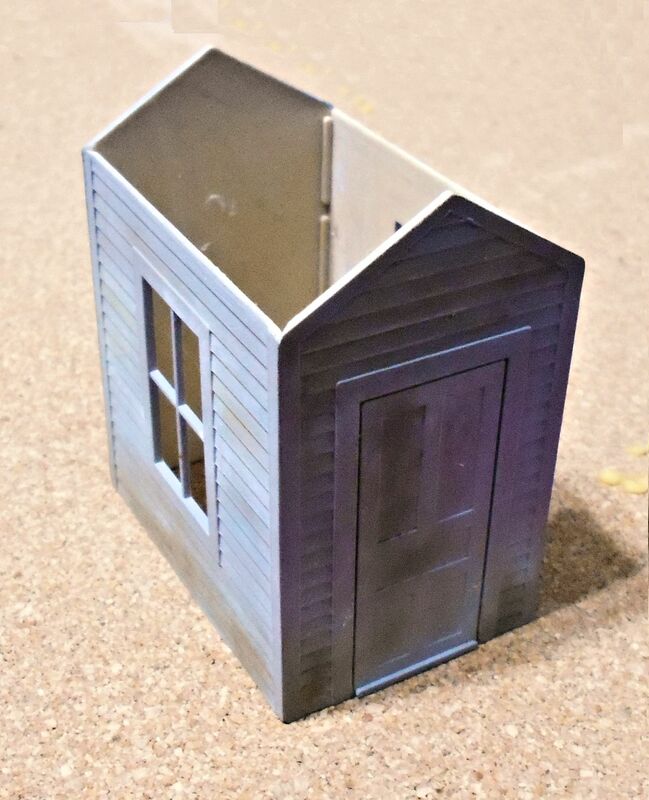 I was going to weather the structure using the hair spray technique so the first thing I did was to spray some gray primer on to simulate grayish weathered wood. I washed a bit mostly along the bottom with a brown. Hairspray Technique: I let this dry well then applied two coats of hairspray. I like to use Tresmé hairspray. Spray a coat just thick enough to shine a bit and let dry. You can use a hair dryer to speed that along. Spray on a second coat and let that dry. This will act as a resist. When you spray paint (light) it will sit on the hairspray coating allowing you to manipulate it. What paint you use will often dictate how well the weathering can be. Tamiya enamels chip very nicely .. with small chips fairly easy to do. Tamiya dries to a hard shell and breaks easily. vallejo paint forms more of a skin .. much like milk drying on a glass and tends to weather off in strips. You just have to experiment. I used neither being lazy .. so I grabbed a rattle can for the paint – valspar leaf green and white. I sprayed a light coat .. just enough to cover of the white and let that dry about an hour. 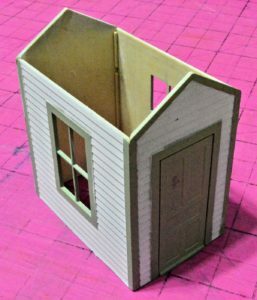 I then *carefully* masked everything except the trim, windows and door and sprayed that with the green. I thought that if the tape pulled about of the white off then no prob as that would be just considered part of the weathering. It didn’t happen so no problem at all. 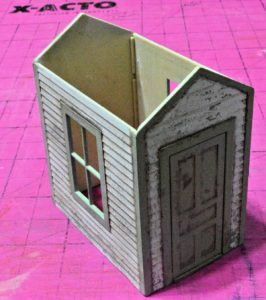 Here is the building, clapboard white and trim, window and door green .. all sitting on a couple layers of hairspray .. waiting for the next step. The next step in the hairspray technique is to remove paint. You use brushes, water and a toothpick or something similar. The basic idea is you are piercing the layer of paint so water gets under and dissolves the hairspray. This lifts the paint which can be made to look like paint that has undergone years of weathering showing the underlying wood (if you spray an object that is supposed to be metal you can spray an undercoat of rust and reveal that through the worn paint). I have a hard brush to get started, the harder bristles help pierce the paint layer. 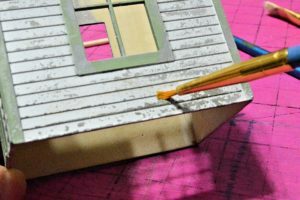 Once the paint starts lifting you can switch to the softer brush .. and .. be very, very careful depending on what paint you used. This is where slower is better. 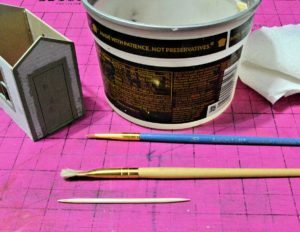 The toothpick is used to scratch and poke at the paint to get water to the hairspray .. again .. switching back and forth to the brushes. In the photo I have a container with water, the tools and a paper towel. That is all that is needed. Here, I am using the stiff bristle brush. Move the brush in a scrubbing motion until the paint starts to lift. 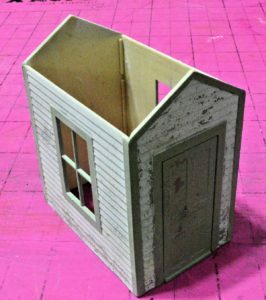 In this case it makes sense to perhaps pay more attention to the lower edges of the clapboard where the weathering would be greater. That is up to you .. and the cool thing about using the hairspray technique in that you have control over where you remove the paint .. it all depends on the size of the tool .. toothpick, brush that you use and how delicate a touch you have. The gray “wood” you see being exposed is simply the gray primer coat I put on first. I am using the softer brush here. Once the paint has started to lift you can and should be more delicate in your movement. You can concentrate in a smaller area and the softer brush helps with that delicacy required for precise control of what paint is removed. Take your time. You can always take away more paint .. it is a lot harder to put it back. 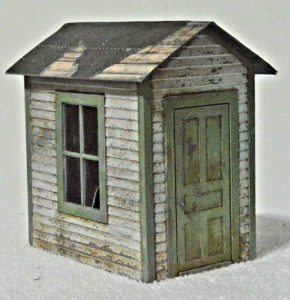 I also have chipped the trim and window but it is harder to see the gray against the green unlike the white clapboard. Ok. 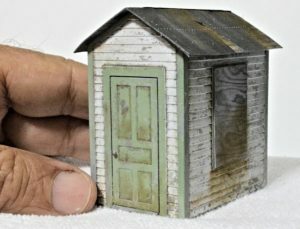 This is what the end result of chipping the paint using the hairspray technique. There are other techniques such as adding chips with a sponge but IMO this allows much greater control. If you wanted you could simply leave it as is. I said above that the chipping was complete and you could if you wish be happy with the results. We can go further though. Since the lights on our layout are very dim compared to how the sun lights something outdoors that we often need to enhance shadow to punch that model up just a bit. I applied a pinwash. This is simply a thin .. very thing .. color. It can be acrylic, solvent based or oil paint. A plus with using a solvent based pinwash is that a cue tip moistened in thinner allows you to remove excess pinwash. 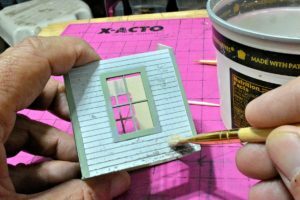 Use a small tipped brush and apply the pinwash so it runs along all the joints. That’s pretty much it. I got lazy and didn’t want to mess with adding glass to the window on this side so I found a old gray sheet of plywood online and printed that out to cover up the window. 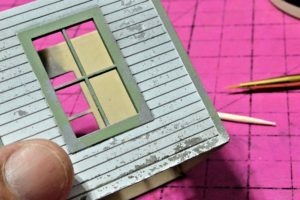 I added a nasty bit of brown to under the window using some of the brown wash and then some brown weathering powder there and on the roof. The doorknob is simply a pin head with a ‘blob’ of super glue and paint. 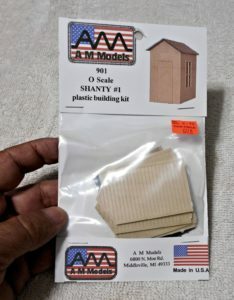 I call this finished .. and am pretty happy with the cheapest of kits.